Benjamin Peirce, an American mathematician and astronomer, was born Apr. 4, 1809. Peirce taught the mathematical sciences at Harvard for over fifty years, until his death in 1880. He was a stellar mathematician, but today we will focus on an aspect of Peirce’s world view that we find interesting. Peirce was a devout Christian, and he saw mathematics as a means of worship, since it allowed him to come closer to the mind of God. In fact, he believed that God is above all a mathematician, so one could hardly appreciate the extent and depth of his handiwork if one does not engage in mathematics. Peirce was expanding on an earlier idea, that science is a path to God because it reveals the “other” Holy Book, the Book of Nature, which is just as necessary as the Book of Scripture for understanding the Wisdom and Providence of God. This notion goes a long ways back, at least to Robert Boyle and John Ray in the late 17th century, when this approach came to be called Natural Theology. There were many books published in the centuries up to Darwin that argued for a theology of nature, and just after Peirce got his appointment at Harvard, there appeared in England the Bridgewater Treatises (1834-36), eight volumes that demonstrated (or at least argued) that the study of astronomy, or geology, or biology, shed light not only on the Creation, but also on the Creator. But most natural theologians were natural scientists, and they were more concerned with showing that God is a great Designer and had planned the world with admirable foresight. Peirce had a different motive entirely. He was a Platonist and an idealist, good friends with Ralph Waldo Emerson and his transcendental Unitarians, and Peirce thought that contemplating mathematical truths could take us right into the Mind of God. If God is truly infinite, as he must be, what discipline besides mathematics could possibly understand and embrace that infinity. And since Peirce was the most brilliant American mathematician of the century, his mathematical idealism attracted a lot of attention, especially from those such as Emerson and his friends, who were not mathematicians but who liked the idea of walking straight into the mind of God. We have a number of works by Peirce in the Library, on math and mechanics, but his mathematical theology did not appear in print until his Ideality in the Physical Sciences was published (posthumously) in 1881. We do not have this work in our Library. Peirce was also one of the founding members of the National Academy of Sciences, appointed to that position by President Lincoln in 1863. Sixty-one years later, in 1924, a muralist named Albert Herter was commissioned by the Academy to recreate the scene in which Lincoln signed the Academy into existence. 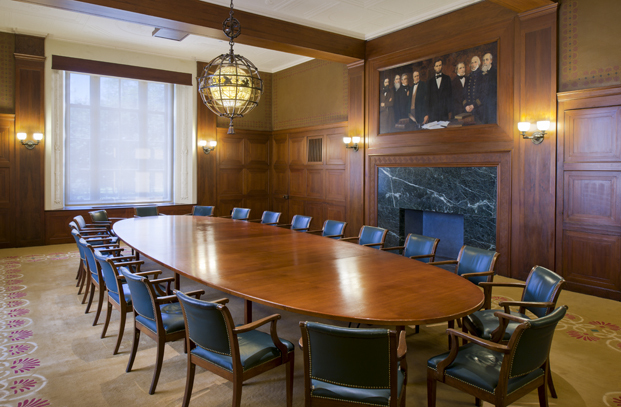 The group portrait still hangs in the academy boardroom (second and third images). Peirce is the man at the far left, with the full black beard. We showed this portrait once before in this space, when we featured Alexander Dallas Bache, who stands right next to Peirce. There is a splendid portrait of Peirce at Harvard, painted by Daniel Huntington in 1857 (first image). We featured a more famous painting by Huntington, depicting the “Projectors” who sponsored the laying of the Atlantic Cable, when we profiled Peter Cooper some four years ago. Benjamin Peirce was the father of Charles Sanders Peirce, the logician and in turn the father of pragmatism. Charles Sanders outranks his dad in the opinion of philosophers of science, but round these parts, Benjamin holds his ground.